Since the first report of practical OLED by Tang and VanSlyke in 1987, arylamine derivatives are mainly used as a hole-transport material (HTM). In this chapter, we summarized and demonstrated representative wide-energy-gap HTMs based on arylamine derivative for use in second- and third-generation OLEDs. Further, some reports regarding the operational stability of high triplet energy (ET) HTMs are introduced, and future challenges are briefly discussed. Since the first report of a practical OLED by Tang and VanSlyke in 1987, arylamine derivatives have mainly been used as a HTM (Tang and VanSlyke 1987; Xiao et al. 2011; Sasabe and Kido 2011; Yook and Lee 2012). 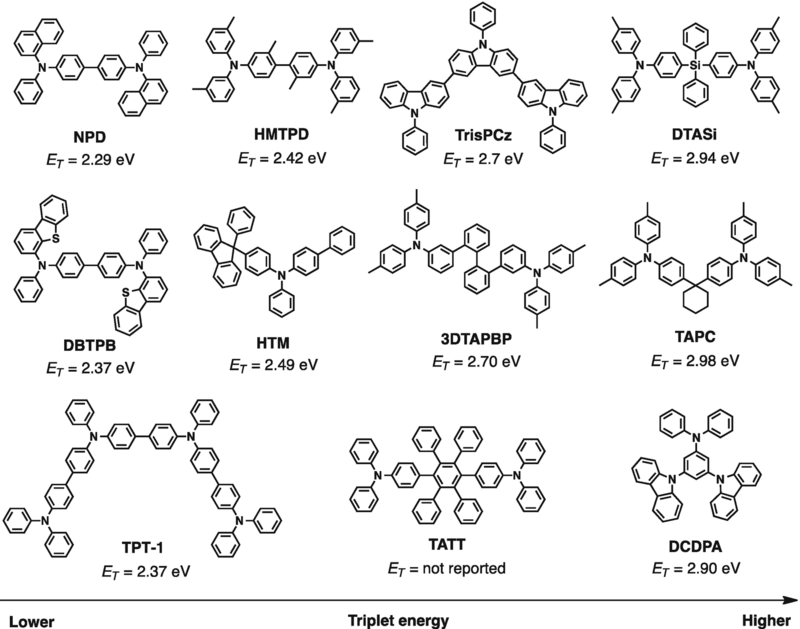 As a representative example, a systematic investigation of a series of TPD derivatives has been shown by Adachi and co-workers that oligomerization is a promising way to improve thermal stability (Aonuma et al. 2007). In addition, oligomers of TPD derivatives have significant molecular-shape anisotropy. By using variable-angle spectroscopic ellipsometry (VASE), Yokoyama and co-workers revealed that a series of oligomers of TPD derivatives exhibit horizontal molecular orientation in a vacuum-deposited film (Yokoyama 2011). However, TPD derivatives such as 4,4′-[N,N′-(3-tolyl)amino]-3,3′-dimethylbiphenyl (HMTPD, ET = 2.42 eV) and N,N′-bis(4-diphenylamino-4′-biphenyl)-N,N′-diphenyl(1,1′-biphenyl)-4,4′-diamine (TPT1, ET = 2.37 eV) have a low ET of 2.4 eV, which is almost below the limit for second- and third-generation green OLEDs for confining their molecular excitons (Fukagawa et al. 2013). Furthermore, a commercially available and widely used HTM, TAPC, has a very high ET of 2.98 eV; however, TPAC is reported to be thermally unstable (Tg = 78 °C) and to have a short lifetime (Kondakov 2008). Therefore, wide-energy-gap HTMs with long lifetimes must be developed to confine the triplet exciton of second- and third-generation emitters. Figure 1 summarizes a number of wide-energy-gap HTMs. Among these HTMs, bis[4-(p,p’-ditolylamino)-phenyl]diphenylsilane (DTASi) based on a tetraphenylsilane skeleton has a very high ET of 2.94 eV (Tanaka et al. 2007). DTASi was developed by Kido and co-workers, who also developed 2,2-bis [3-(N,N-ditolylamino)phenyl]-biphenyl (3DTAPBP) based on a quaterphenylene skeleton (Agata et al. 2007), which has an ET of 2.70 eV. 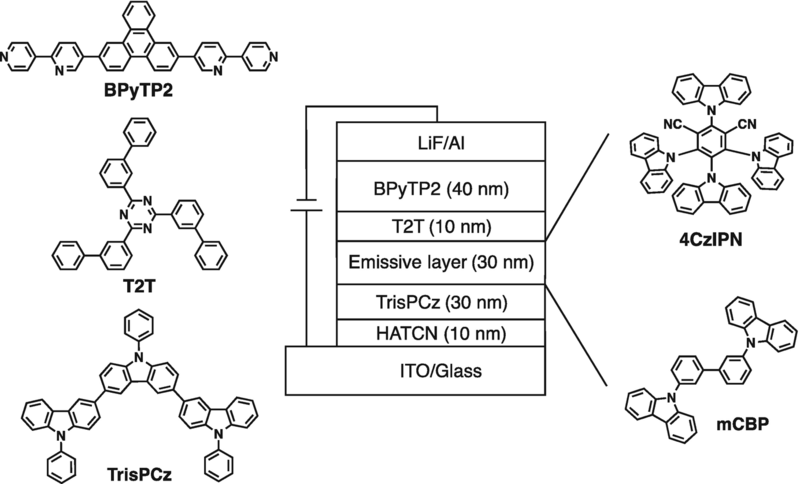 DTASi, 3DTAPBP, and TATT based on hexaphenylene skeleton have been used in iridium(III)bis(4,6-(difluorophenyl)pyridinato-N,C′)picolinate (FIrpic)-based sky-blue phosphorescent OLEDs, which have a high external quantum efficiency ηext of up to 20% (Tanaka et al. 2007; Agata et al. 2007; Watanabe and Kido 2007). Similarly, Lee et al. 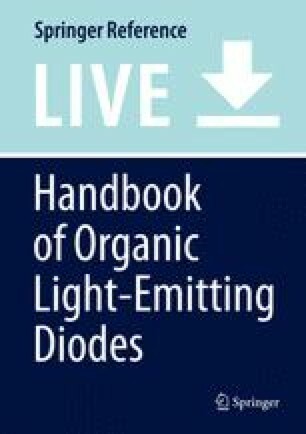 developed 3,5-di(9H-carbazol-9-yl)-N,N-diphenylaniline (DCDPA, ET = 2.90 eV) for high-performance RGB phosphorescent OLEDs with an ηext of 25% (Cho and Lee 2011). Only few reports exist regarding the operational stability of high-ET HTMs. In 2013, Fukagawa evaluated the operational stability of tris[4-(o-tolyl)pyridine]iridium(III) [Ir(mppy)3]-based green phosphorescent OLEDs by using a number of HTMs (Fig. 2) (Fukagawa et al. 2013). 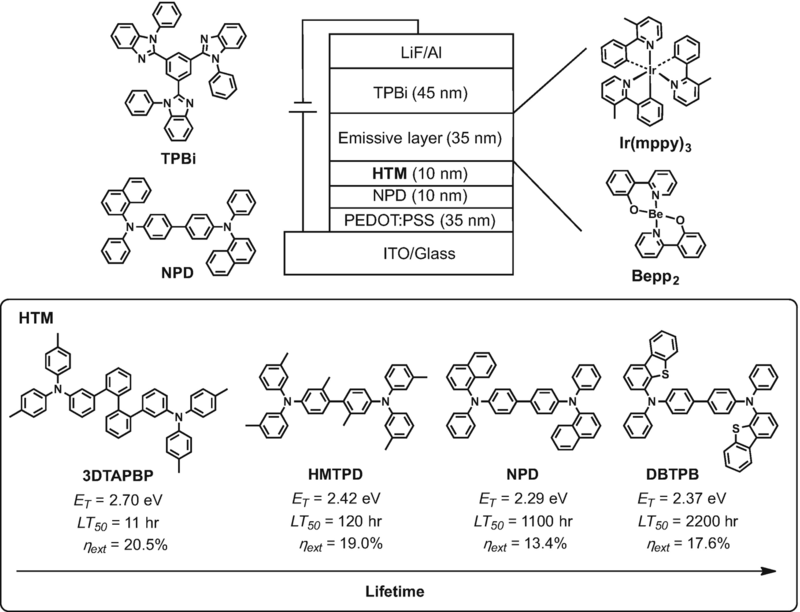 In this device structure, 3DTAPBP-based OLEDs showed superior performance with a peak ηext of 20.5% because of the high ET; however, a long half-decay time (LT50) was reported to be only 11 h at an initial luminance of 1000 cd/cm2. However, NPD-based OLEDs showed inferior OLED performance with a peak ηext of 13.4% because of the low ET of 2.29 eV, although the LT50 was reported to be 1100 h under the same conditions. Among the HTMs tested, DBTPB-based OLEDs exhibited superior performance with a peak ηext of 17.6% because of the high ET of 2.37 eV; they also have a LT50 of 2200 h. Fukagawa and co-workers concluded that amine derivatives with dibenzothiophene are effective HTMs for highly efficient and stable green phosphorescent OLEDs. Another example of the operational stability of high-ET HTMs is TADF. In 2013, Nakanotani and Adachi reported the operational stability of TADF-based devices by using a combination of 1,2,3,5-tetrakis(carbazol-9-yl)-4,6-dicyanobenzene (4CzIPN), a high-ET host material, 3,3-di(9H-carbazol-9-yl)biphenyl (mCBP), and the HTM 9,9′,9″-triphenyl-9H,9′H,9″H-3,3′:6′,3″-tercarbazole (TrisPCz, ET = 2.7 eV) (Fig. 3) (Nakanotani et al. 2013). In this device structure, a 4CzIPN-based OLED had superior performance with a peak ηext of 14.0% and an LT90 of 243 h at an initial luminance of 1000 cd/cm2. 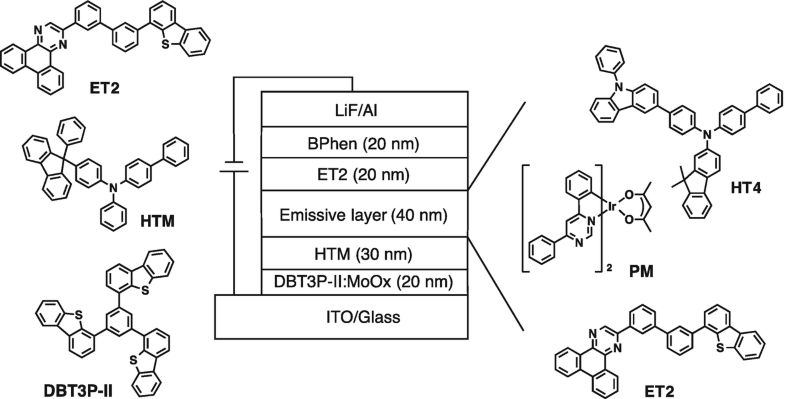 Ir(ppy)3-based OLEDs had superior performance with a peak ηext of 11.8% and an LT90 of 130 h under the same conditions. An example of operational stability with a high-ET HTM was reported by Seo and co-workers. A bulk-exciplex-based yellow phosphorescent OLED using a HTM and HT4 gave a power efficiency of over 110 lm/W, a peak ηext of 31%, and a LT50 of 30,000 h at 5000 cd/cm2 (Fig. 4) (Seo et al. 2014). These excellent performances can be attributed to the effective confinement of triplet excitons of the emitter, PM, and balanced carrier transport from the exciplex-based host system. Table 1 summarizes the optical and physical properties of HTMs. To boost the efficiency of second- and third-generation OLEDs, a key challenge is to achieve both good hole transport and high ET within a single molecule. A commercially available and widely used HTM, TAPC has a very high ET of 2.98 eV; however, TPAC is reported to be thermally unstable (Tg = 78 °C) and to have a short lifetime. Some reports reveal a promising stability of high-ET HTMs, even though they have shorter π-conjugation lengths. Until recently, HTMs were limited to arylamine derivatives, so another challenge is to develop high-ET, long-operational-lifetime HTMs without using arylamine derivatives.